Touro Law Basketball Society, officially established in Fall 2008, aims to use basketball to provide networking opportunities with other law schools and big Manhattan firms through participation in Lawyers' Basketball League of NYC. Law Schools compete every Spring semester. Winners of the Law School Division play against champions of the highest-ranked Law Firm Division at Madison Square Garden in mid-April. (http://lawyersleague.com/lbl.htm) . Touro had made it to Madison Square Garden to the Championship Game in 2010! 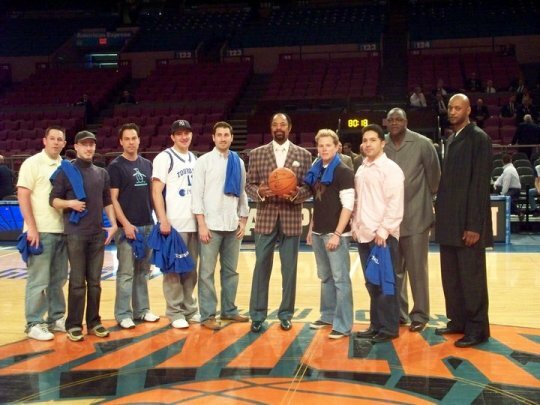 Touro honored at Knicks vs. Washington Wizards pre-game shoot-around on April 12, 2010. pictured here with former NBA superstars: Walt "Clyde" Frazier, John Wallace and Gerald Wilkins. Also, since 2001, Touro has participated in a 3-day annual Northeastern Law School Tournament, held at Western New England College School of Law every mid-February. The tournament has been active for over 30 years. 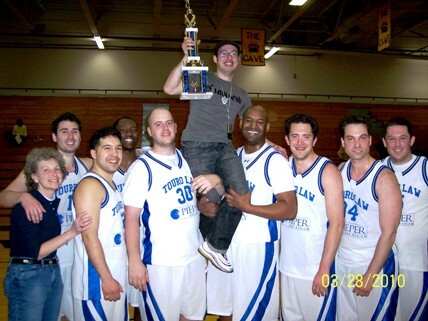 Touro had won in the Men's Division of the 35th Annual WNEC Law Invitational held on March 26-28, 2010! Additionally, every Fall semester, we play in a highly competitive amateur local basketball league called LI HOOPS. Please visit our Frequently Asked Questions page for in-depth information about every tournament.